In three of the last four years the number of national manufacturing establishments grew according to the U.S. Census Bureau County Business Patterns, which may be a surprising but welcomed trend. As NIST MEP regional managers, we examined this trend as it related to the Pacific Northwest region and in comparison to national trends. With more establishments, the future potential for diversified growth and more jobs in manufacturing may be stronger. The Pacific Northwest is one of six regions covered by NIST MEP and includes Alaska, California, Hawaii, Idaho, Montana, Nevada, Oregon, Washington, Wyoming and Utah. Looking at Chart 1 below, from 2011 – 2015 there was an increase in the number of manufacturing establishments in three of the last four years. In fact, the region saw even greater growth in the number of manufacturing establishments compared to U.S trends, during those years. We also compared the overall, absolute number of manufacturers in 2015 compared to 2011, in the region versus the nation in Chart 2. This show that the total number of U.S. manufacturers was still down in 2015 compared to 2011 even after the growth in three of the four years. 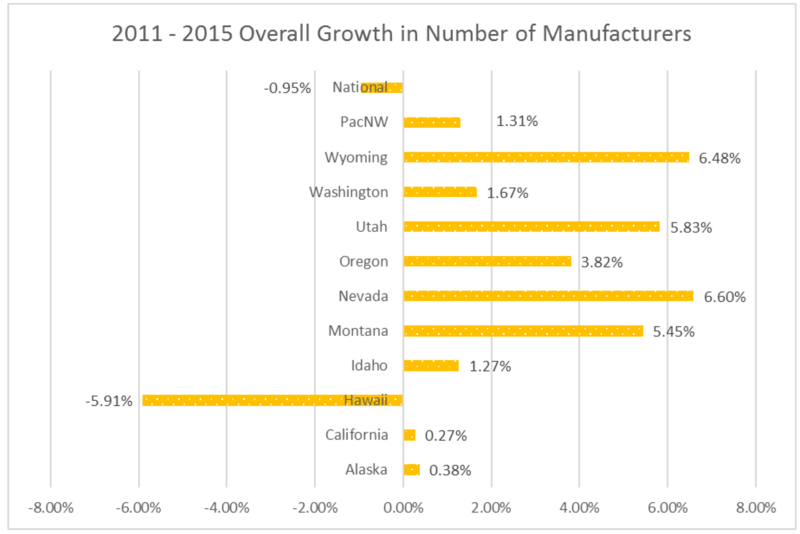 In contrast, all the Pacific Northwest region states except Hawaii showed an overall increase in the number of manufacturers in 2015 compared to 2011 led by Montana, Nevada, Oregon, Utah and Wyoming at rates almost four to six times the national growth over the same time period. California accounts for 66% of the manufacturing establishments in the region. However, California only saw a 0.27% increase in the number of establishments over that same time frame, basically remaining stable. In some states like Nevada, larger companies have relocated major facilities, and suppliers have moved to be close for better supplier relations. 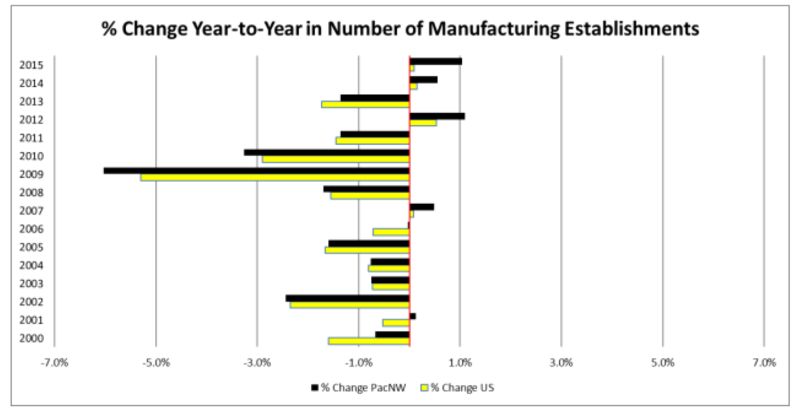 A look at the 2011 to 2015 timeframe showed that the Pacific Northwest growth occurred over several size categories of manufacturing firms, not just the smallest or startups. The industries exhibiting major growth included beverage (breweries, wineries, sports drinks, etc.) by over 50%, with much smaller increases in food (6.03%) and chemical manufacturing (5.57%) respectively. How we can take these positive trends and expand them across the nation? That is a great challenge and a worthy goal. The Boston Consulting Group issued several reports highlighting the changing economics of global competitiveness and suggesting the growth of manufacturing in the U.S. is a result of labor prices increasing overseas and proximity to markets. We at NIST MEP are working diligently with manufacturers and communities to help grow manufacturing in the U.S. – perhaps we are seeing the beginning of a full-scale trend. Let’s take these lessons and empower our manufacturers not just in the Northwest but across the nation.